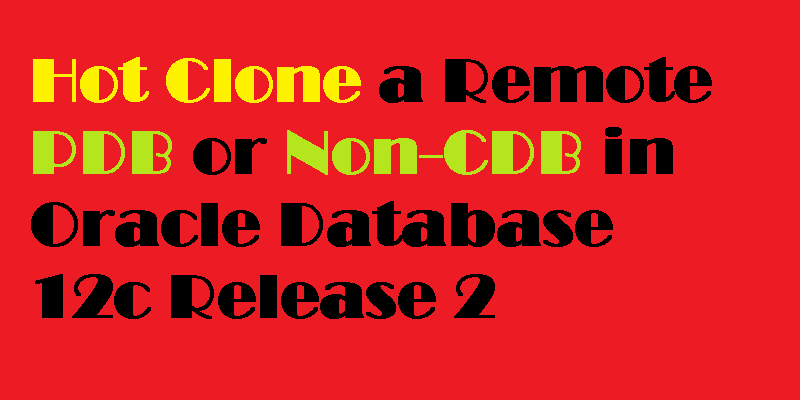 This article will guide you through the steps to hot cloning a remote pdb or non-cdb in oracle database 12c release 2 (12.2). The initial release of Oracle Database 12c Release 1 (12.1.0.1) remote cloning of PDBs was listed as a feature, but it didn't work. The 12.1.0.2 patch fixed that, but also added the ability to create a PDB as a clone of a remote non-CDB database. The biggest problem with remote cloning was the prerequisite of placing the source PDB or non-CDB into read-only mode before initiating the cloning process. This made this feature useless for cloning production systems, as that level of down-time is typically unacceptable. Oracle Database 12c Release 2 (12.2) removes this prerequisite, which enables hot cloning of PDBs and non-CDBs for the first time. The prerequisites for cloning a remote PDB or non-CDB are very similar, so i will be handling them together. Note: In this context, the word "local" refers to the destination or target CDB that will house the cloned PDB. The word "remote" refers to the PDB or non-CDB that is the source of the clone. I have three databases running on the same virtual machine as an example for this article, but they could be running on separate physical or virtual servers. Create a user in the remote database for use with the database link. In this case, we will use a local user in the remote PDB. Create a new PDB in the local database by cloning the remote PDB. In this case we are using Oracle Managed Files (OMF), so we don't need to bother with FILE_NAME_CONVERTparameter for file name conversions.